This is one of the most exciting political novels I have read. Joy Kogawa is beloved by Canadian readers for her first novel Obasan (1981), which tells the story of a young Japanese Canadian girl, Naomi, caught up in the dispossession, relocation and scattering of Canada's Japanese community during World War II. The titular Obasan is Naomi's eldest aunt, an issei (first-generation Japanese immigrant) who cares for Naomi and her brother Stephen through the terrible time. Kogawa later wrote a children's book based on these experiences called Naomi's Road (1986), which was made into a short opera and toured to schools in British Columbia by the Vancouver Opera. 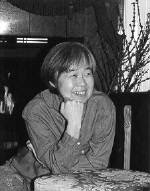 Kogawa is also a poet - which shows in the vivid and accurate language of her fiction. This second novel begins when a painfully introverted Naomi, now in her forties, finally leaves the prairie and her job teaching English in a rural Bible college, and arrives in Toronto, to live with a very different relative - Aunt Emily. The title Itsuka is a Japanese word for someday. Most of the beginning of the novel is about what happened to Naomi and Stephen after the end of the previous book - the someday of a child's adulthood. Among Kogawa's insights there are very penetrating lines about rural Christian fundamentalism and naturally something about prejudice directed at children isolated from most of the members of their own race and culture. The remainder of the novel is primarily about struggle within the Japanese community over whether to ask the Canadian government for reparations for what was taken from them, and then how to manage the process among themselves. The process Kogawa depicts must obviously have been built on close observation of her community; however, the nature of the struggle, is much like that in many emerging groups. Beginning with resistance to autocracy, democratic organization emerges within the community; and during the process of struggle, leaders emerge and pride and a sense of community identity come to be.